Pekiti Tirsia Kali is a system that allows a person to develop the ability to defend themselves against either impact or bladed weapons, while improving their sense of spacial relations, and agility. The Capital Area Kali Group is made up of students who take their self-defense training seriously. 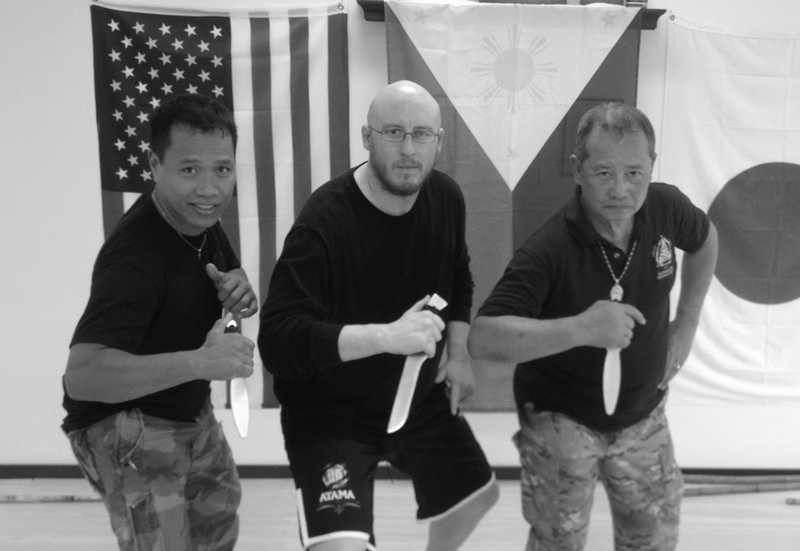 They know that training in Pekiti Tirsia Kali will facilitate the development of the necessary fighting attributes that they might need in a self-defense situation. Furthermore, they realize that this training is a crucial part of the various ranges involved in a reality-based self defense system. Learning the distance and timing for this range, plus the grace required to master the various techniques, helps them round out their training. Kali is the indigenous fighting art of the Philippines, using either empty hand, impact or bladed weapons. With its cultural and philosophical values, its history traces back more than 1500 to 2000 years in the past. The Pekiti-Tirsia system of Kali is the family system of the Tortal Family and is headed by Grandtuhon Leo Tortal Gaje, Jr. Right from the beginning Pekiti-Tirsia Kali convinces with its logical and consequent self-protection system, which is based on the strategic and tactical application of counter-offensive techniques as defense. WHY SHOULD I LEARN PEKITI TIRSIA KALI? Learning Pekiti Tirsia Kali will help you improve your awareness of your surroundings, develop a better sense of distance and timing, and facilitate your agility. This is all being done while you’re learning real-world self defense techniques that are battle tested, and working on your fitness goals. Thus, you’re maximizing your time receiving multiple benefits. There really is no better setting to accomplish all this, plus it’s fun too! HOW CAN I GET STARTED TRAINING? First, you need to see if it is for you. We make this easy. We give you a two week trial period for only $20. This gives you a chance to check us out and meet our instructors. You can take (or watch) any class you want. This makes it easy to decide if this is really for you. Most people like it so much, they decide they want to do it after their very first class. Take an hour out of your life and come in to try some free training. Put yourself in a position to make an informed decision. Interested In Trying Out The Capital Area Kali Group? If you think you deserve the best, and you have the perseverance to train, what are you waiting for? Being in law enforcement, it’s really important to know how to deal with a variety of self-defense situations. So I sought out a place where I could learn additional self- defense techniques. I was very lucky that I discovered The Fighters Garage and Asher. His knowledge of the law enforcement curriculum for Krav Maga and Gracie Jiu-Jitsu is tremendous. He can do it, he can teach it, and he can teach us how to teach it to others. You can’t beat it. You should try it. In the year that I’ve been here, I’ve tried out the Krav Maga, Gracie Jiu-Jitsu and Pekiti Tirsia Kali classes. I love them all. It’s great to learn some self-defense, get fit, and have a lot of fun with a great group of folks. I thought that being a woman might make it harder for me to train, but I was wrong. Everyone, both teachers and students, is friendly, helpful and wants you to succeed. As long as I am here, I’m training at The Fighters Garage!